Bernard Gallay at Bernard Gallay Yacht Brokerage tells me he's now take over the central agency for sale of the 23.98m sailing yacht Whimsy. 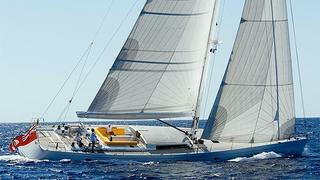 Built by New Zealand’s Vaudrey Miller yard in 2005 to a design by Philippe Briand, Whimsy features a clean, uncluttered interior by Frank Darnet. The interior has a roomy, bright and slightly raised saloon and three guest staterooms, forward and amidships, all with en-suite bathrooms. She has the sensitivity and performance of a racing yacht but fulfills the criteria of a true blue-water cruiser, conceived to sail around the world in comfort and safety. Lying in Malta, Whimsy is asking €2.85 million.